Scotland Under-21 coach Billy Stark has been hit by four withdrawals from his squad to face Greece. Wigan midfielder Fraser Fyvie, Raith striker David Smith, on loan from Hearts, Livingston's Stefan Scougall and Celtic defender Lewis Toshney, on loan to Dundee, are all out. Hearts midfielder Callum Tapping and Motherwell defender Fraser Kerr have been added to the squad. The Scots face their hosts in Corinth on Wednesday. "We are a wee bit tight with numbers but it depends where you are in the building process," said Stark. "We're at the stage now, going into a championship game, that I wouldn't want to have a whole big squad of players to try to fit in. "We are quite comfortable with the ones we've got. "It means when we go into the championship game in six week's time, we've blooded another couple of players that, if needed, are there for us." Stark had named four new players in his squad to face Greece. Partick Thistle duo Stephen O'Donnell and Stuart Bannigan were called up to the 18-man squad. Celtic goalkeeper Robbie Thomson was handed a chance to impress, with regular keeper Jordan Archer in action for Wycombe on Monday. Kilmarnock forward Rory McKenzie was the last new face in the squad. 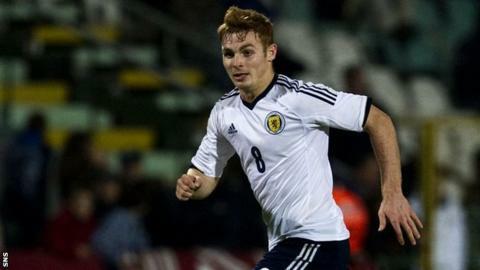 Stuart Armstrong, Rhys McCabe and Tony Watt, who missed the 3-2 friendly defeat to Portugal in November through injury, returned. The Uefa European Championship qualifiers draw took place last Thursday, with Stark's side being grouped with Netherlands, Slovakia, Georgia and Luxembourg for the 2013-15 event. "As with most draws, it could have been better and it could have been worse," said Stark. "We always approach it in terms of we've got a realistic chance of qualifying. "We've taken it to the last game every time and we hope to do that again."